Frontalis suspensions with alloplastic slings are well established.1,2 The thick eyebrow skin of infants is prone to scar formation. Forehead scars caused by frontalis suspension procedures can be problematic. We describe a technique of congenital ptosis surgery that avoids eyebrow incisions. This new procedure utilises a Nylon monofilament suture for frontalis suspension. The Nylon suture is passed in a circlage fashion via puncture wounds without making eyebrow incisions. Two puncture sites, approximately 10 mm apart, are marked 3 mm above the lash line centred over the area of desired maximal eyelid elevation. Another two puncture sites are marked above the eyebrow approximately in line with the lateral and medial canthi. The path of the circlage is marked out by joining the marked puncture sites. The eyelid and eyebrow are infiltrated with local anaesthetic with adrenaline (epinephrine). A Keith needle is dual threaded with a 4/0 Nylon and a 4/0 Vicryl suture. It is then passed from one eyelid puncture site towards the corresponding eyebrow exit site in a sub-orbicularis plane (fig 1, top left) with the globe protected by a lid guide. From this site, the needle is passed through the needle track to the adjacent eyebrow puncture site (fig 1, top right) and then down towards the remaining eyelid puncture site. At this point in the procedure, the ends of the Nylon and Vicryl sutures emerge through the two eyelid puncture sites. The two ends of the Vicryl suture are then manoeuvred in a sawing fashion to create friction to release skin dimpling at the eyebrow exit sites (fig 1, bottom left). The Vicryl suture is then removed and the Nylon suture needle (SH needle) is passed from one eyelid puncture site to another via a deep, partial thickness tarsal passage with the eyelid everted to ensure no full thickness penetration (fig 1, bottom right). The two ends of the Nylon suture, exiting at one eyelid puncture site, are tied and the tension adjusted to achieve the desired lid elevation and contour. Occasionally, peaking of the eyelid occurs and can be managed by slightly enlarging the puncture site at the tight suture end with a Westcott scissors and gentle spreading to undermine the soft tissues around the suture. This undermining action helps to release the suture tension on the puncture site to smoothen out the lid contour but should be done carefully to avoid cutting the suture. The puncture sites usually do not require closure. (Top left) A Keith needle, threaded with a Nylon and a Vicryl suture, is passed from one eyelid puncture site to the corresponding eyebrow puncture site in a sub-orbicularis plane. (Top right) The Keith needle, loaded with the sutures, is passed from one eyebrow puncture site to another. (Bottom left) The 4/0 Vicryl suture is manoeuvred in a “sawing” manner with both hands to release the soft tissues at the eyebrow puncture sites to avoid skin dimpling. (Bottom right) The 4/0 Nylon suture is passed from one eyelid puncture site to another taking a partial thickness bite. The eyelid is everted during this tarsal passage to ensure no full thickness penetration. 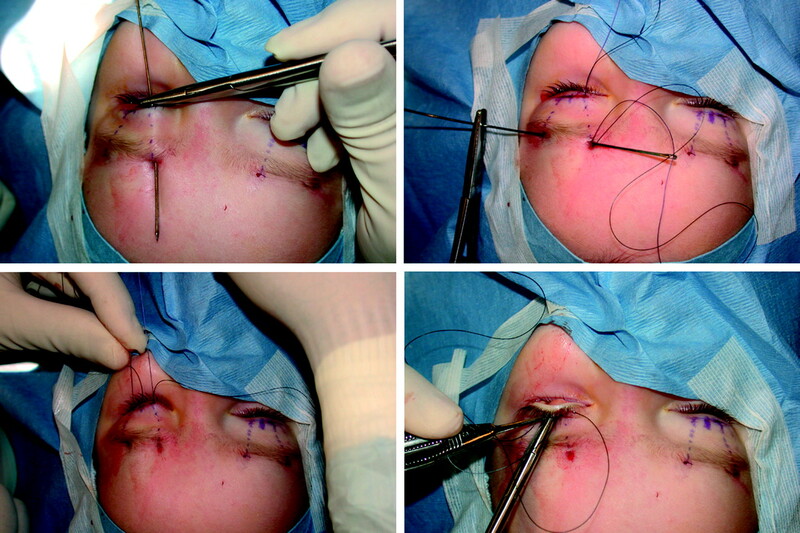 We performed this surgery on three infants with visually significant congenital ptosis. The mean age and follow up period of the infants were 5.6 months and 6.9 months respectively. The visual axis was cleared in all patients as measured by an improvement of their margin reflex distance one (MRD1). The lid contour was good in all patients. An example is illustrated in figure 2. There were no intraoperative or postoperative complications. The eyelid puncture sites healed without visible scar. (Left) Preoperative picture of a 1 year old girl with bilateral congenital ptosis and a chin-up position. The child has bilateral poor levator function. (Right). Postoperative picture of the patient after bilateral frontalis suspension using the described technique. Both the eyelids are adequately elevated with a satisfactory contour although the chin-up position is not totally ameliorated. Wagner RS, Mauriello JA Jr, Nelson LB, et al. Treatment of congenital ptosis with frontalis suspension: a comparison of suspensory materials. Ophthalmology 1984;91:245–8. Steinkogler FJ, Kuchar A, Huber E, et al. Gore-Tex soft-tissue patch frontalis suspension technique in congenital ptosis and in blepharophimosis-ptosis syndrome. Plast Reconstr Surg 1993;92:1057–60. Crawford JS. Repair of ptosis using frontalis muscle and fascia lata: a 20-year review. Ophthalmic Surg 1977;8:31–40. Wilson ME, Johnson RW. Congenital ptosis. Long-term results of treatment using lyophilized fascia lata for frontalis suspensions. Ophthalmology 1991;98:1234–7. The authors have no financial interest in this paper.